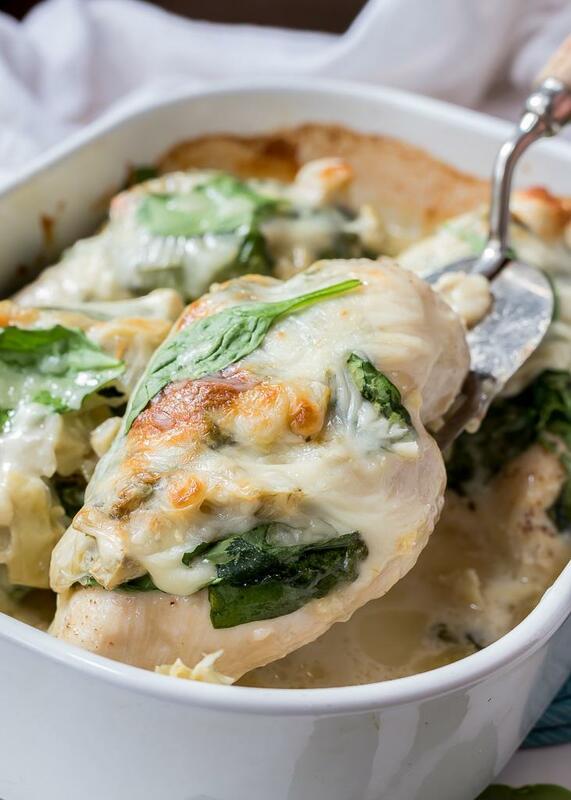 Spinach Artichoke Smothered Chicken Breast is fantastic for a weeknight dinner. It is quick, easy, nutritious and the whole family will love it! 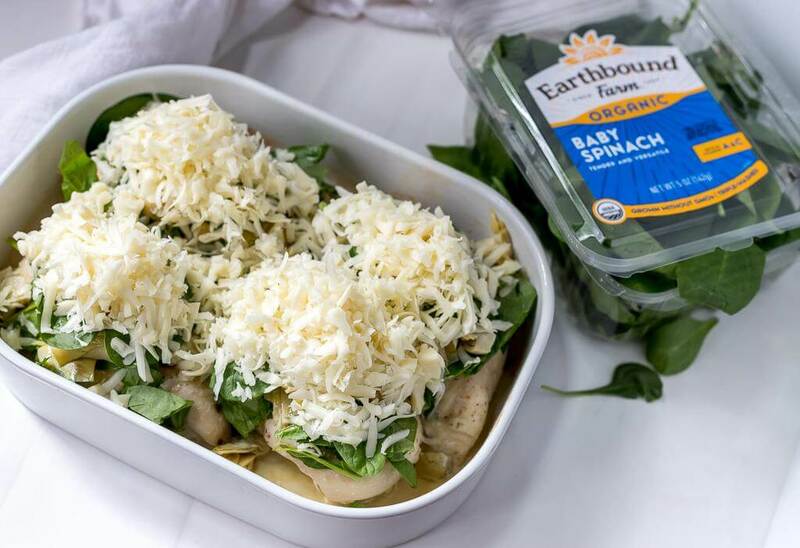 Chicken breast topped with fresh baby spinach, marinated artichoke hearts and mozzarella cheese. This recipe is great for anyone following a low carb or Keto diet. This time of year everything gets so busy and fast paced. 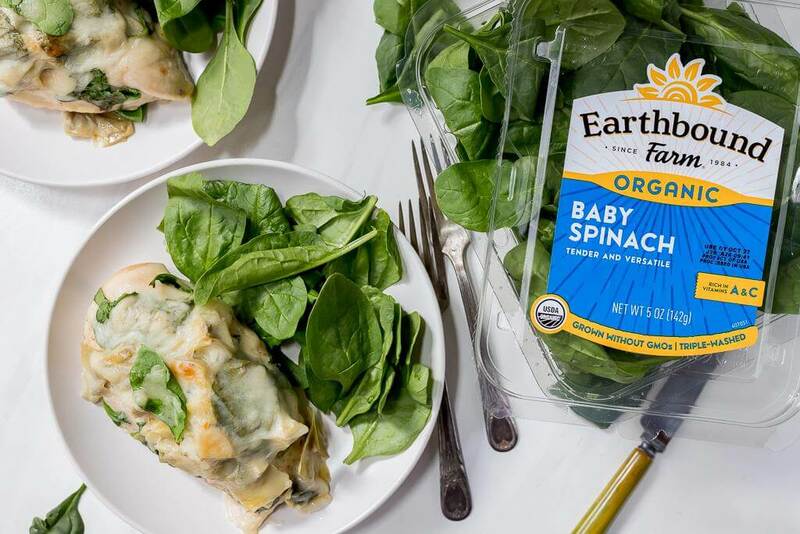 That is why this Spinach Artichoke Smothered Chicken is so perfect. You can get a nutritious dinner on the table without any fuss. Bonus points for it not being the usual boring baked chicken. We are all worried about feeding our families food that will nourish them. After my recent trip to the Earthbound Farm Organic farms I am thinking about food in an entirely different way. I had the opportunity to visit Earthbound Farm’s Farm Stand and attend an Organic Farm Tour. The experience was extremely eye-opening. Earthbound Farm is a Certified B Corporation, meaning they do business in a way that is better for workers, communities and the environment. Earthbound Farm is on a mission to make organic produce more affordable and accessible. I had never put much thought into Organic Farming vs. Conventional Farming. We all just think, okay they don’t use pesticides. The End. Nope. There is so much more to organic farming. It is a complex process that requires experience, knowledge, passion and intuition. Because dangerous pesticides are not an option, the Earthbound Farm farmers have to go on the offensive. And they have a lot of natural tricks up their sleeves like the flowers in the above photo. 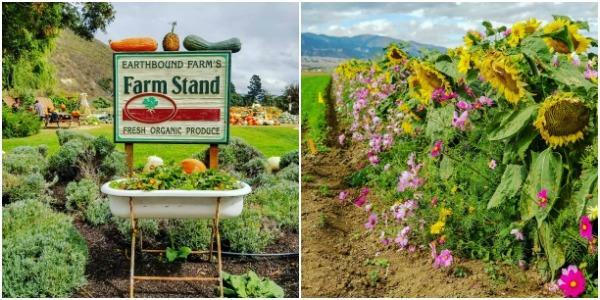 Farmers plant certain flowers alongside the produce to ward off unwanted pests. I’ll take flowers over chemicals any day! 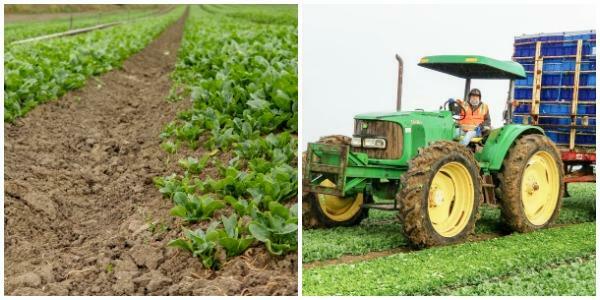 In the grand scope of things, organic farming just makes sense. Not only is the produce better for us but it’s better for the soil, the water, the wildlife and insect population. Plus, it is better for the farm workers. And if all of those reasons don’t sway you. . . it just tastes good. 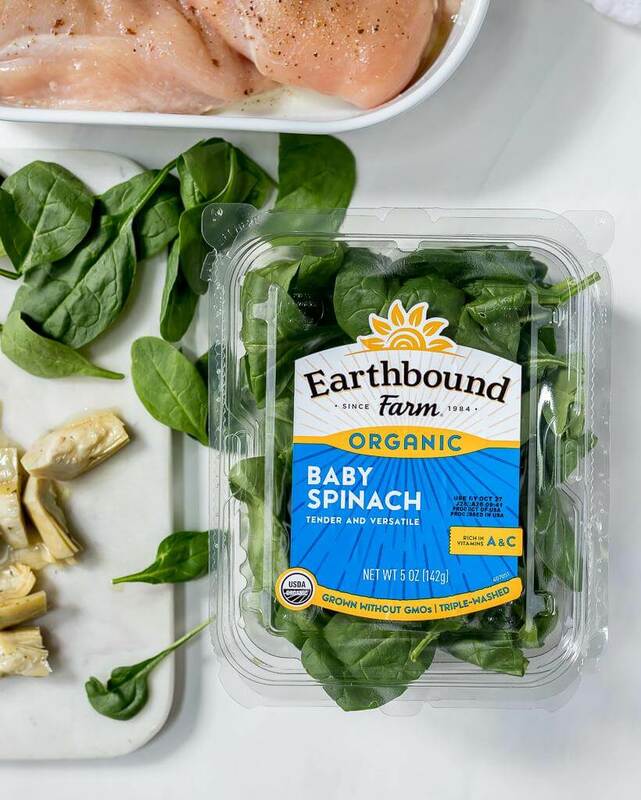 Like the Earthbound Farm Baby Spinach used in this Spinach Artichoke Smothered Chicken. The spinach is the star of this recipe and the artichoke hearts are a strong side kick. And who doesn’t love melty cheese!?!? When I began creating this recipe it started as a stuffed chicken breast. Have you ever made a stuffed chicken breast? It is a huge hassle! It’s difficult to keep the filling inside and there is just not enough filling for my tastes. So I decided to try just topping chicken breast with the “filling”. So much easier and you can really load it up with spinach, artichokes and cheese this way. Win/Win. 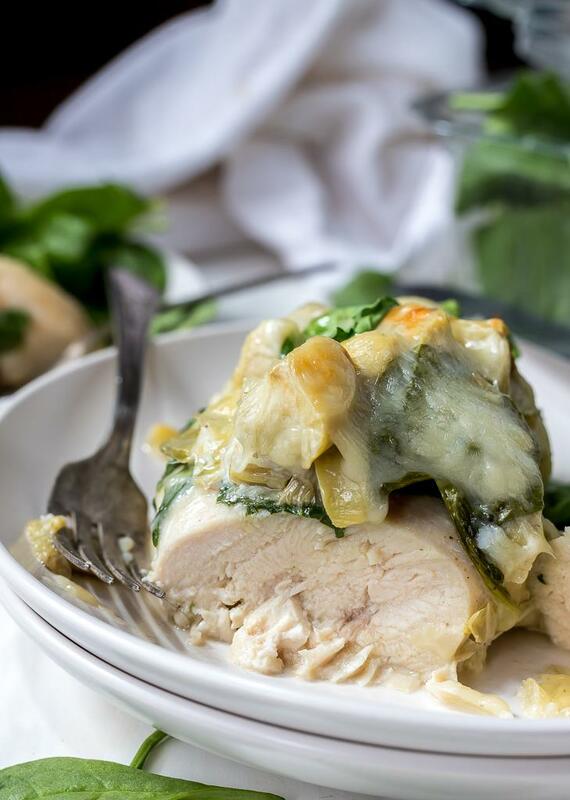 This Spinach Artichoke Smothered Chicken is wonderful served with salad, rice or pasta. It will go with just about any side dish you can think of. It is sure to be a hit with the family and get the little ones to eat their greens. 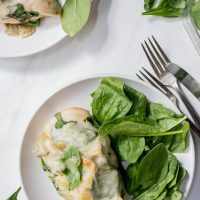 Spinach Artichoke Smothered Chicken Breast is fantastic for weeknight dinner. It is quick, easy, nutritious and the whole family will love it! Chicken breast topped with fresh baby spinach, marinated artichoke hearts and mozzarella cheese. 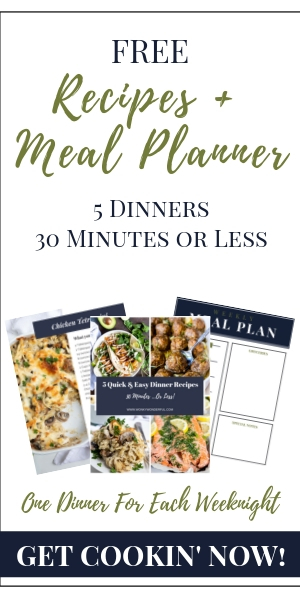 This recipe is great for anyone following a low carb or Keto diet. Oil a 12x9 roasting dish then place the chicken breasts inside, fitted tightly together. Generously salt and pepper chicken then bake 15-20 minutes depending on thickness. 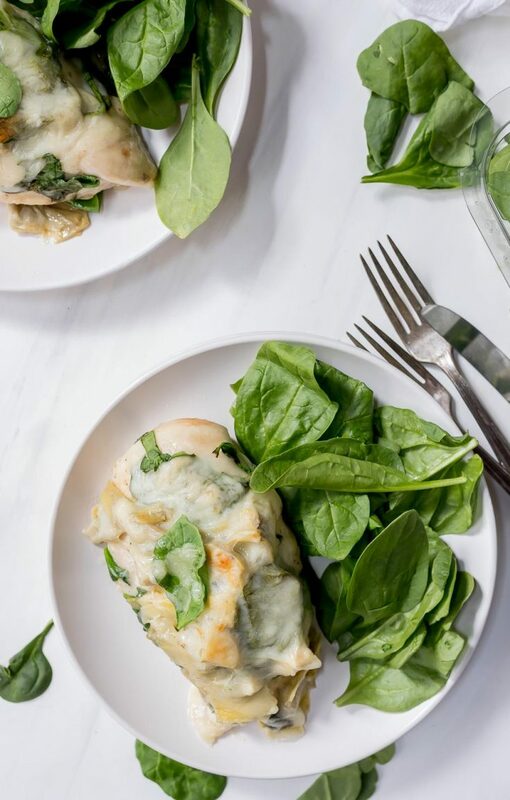 Top chicken with artichoke hearts, spinach and cheese. Bake for 5-10 more minutes or until internal temp of chicken reaches 165ºF. Serve.